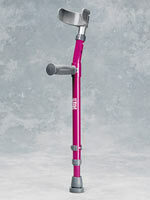 Children's walking aids can be fairly basic canes, crutches, walkers or more complicated gait trainers. The level of complexity will depend on the child's abilities and the degree of help they will need to walk. Walkers are generally used for kids who can bear their own weight through their legs but have trouble with balance or moving their feet when standings. Generally speaking, gait trainers are used when the child has limited ability to bear their own weight and/or needs more upper body support and/or has yet to learn how to walk. There are canes designed for children and they don't differ much from adult versions. The cane can have a single tip which touches the ground or it can be of the quad cane variety with four tips on the ground. The quad cane design is a little more stable for those with balance issues. Whereas with a cane, the weight of the user is supported through the arm or arms, with conventional crutches the weight is primarily supported by the under arm pads and the arms are used for control. The crutches are moved forward in unison while the user's weight is supported by one or both of their legs. Once the crutches are securely positioned forward the user will move their body forward through the crutches to the forward position. Forearm crutches are basically canes which extend up the arm and cup around the forearm. They allow for more support than a cane but are less supportive than a pair of conventional crutches. People who can use them will find them less cumbersome than conventional crutches. There is a knack to using crutches that takes some practice to master. The company or organization who sell you your crutches should take some time to explain the use of them and some instruction from a health care professional would be in the best interest of the user. Pediatric walkers are generally height adjustable and can be either pulled from behind or pushed in from depending on their style and the child's abilities. They can have no wheels, two wheels or four wheels. 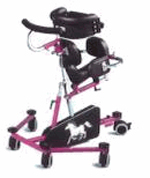 The more wheels on a walker the less stable it is however the more wheels the easier it will be to move. 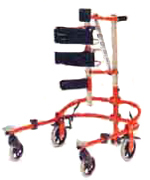 Some types of walker wheels will swivel which eases turning but reduces the stability of the walker. 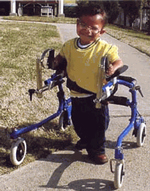 The rear wheels, when four wheels are used, in some cases can have drag brakes which slow the rotation of the rear wheels to make the walker more controllable and stable for the child. Children's walkers can also have forearm attachments (as pictured) which allow the child's weight to be transmitted down through the elbows and forearms to the walker. These attachments are helpful for kids who cannot grip the walker with their hands or support their weight through their hands. Gait trainers are sometimes referred to as walking frames are are usually used to train kids who have never walked to walk or to re-train those who have lost the ability to walk due to an accident or medical event of some type. They are basically walkers which are designed to support a person so completely that there is no way they can fall down while positioned in or on the device. A user in a walking frame doesn't have to support their weight or be concerned with balance. More than any other piece of equipment, the aid and advice of a health care professional, such as a physio of occupational therapist is essential in choosing the best model of gait trainer for the user. This is not usually a major issue for most users as people who are candidates for walking frames are already receiving the services of these professionals.